It’s cold and flu season, but you can combat those nasty germs naturally with essential oils! These recipes from Aromatherapy Kit are perfect for helping relieve everything from coughing to congestion. Your immune system is the most important defender of your body from disease. Add to your diffuser, following manufacturer’s instructions. Excellent for draining nasal and chest cavities, and for stimulating blood flow. 5 drops per 18 ounces of hot water. An anti-rheumatic remedy to sooth and assist with breathing. This is great for the cardiovascular and pulmonary system, as well as a real wake-up call for the lungs. Essential oils are an all-natural way to bring about peace, calm, energy, and many other states of being. An alternative route to stress relief and preventative care, these oils can truly help heal. The Aromatherapy Kit contains all of the most common oils used in home remedies: orange, lavender, peppermint, tea tree, lemon, frankincense, geranium, and cedarwood. They are each profiled so you can use their individual attributes to create a unique blend for exactly what you need, with instructions given on whether oils are to be used topically or diffused around your home. You’ll find ideas on how to use essential oils for cleaning appliances, or freshening up clothes and musky closets. 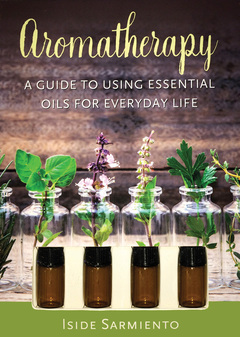 The book also includes advice on how to purchase and store essential oils for all of your aromatherapy uses. Find the aromas that best suit your lifestyles and develop a love for them that will last a lifetime.